Ben Affleck’s widely acclaimed dramatic thriller “Argo” has crossed the $100 million mark at the domestic box office, it was announced by Dan Fellman, Warner Bros. Pictures president of domestic distribution. “Argo” has been applauded by moviegoers and hailed nationwide by critics, a number of whom have called it one of the best films of the year, among many other accolades (you can read our review HERE). At the box office, “Argo” accomplished the extremely rare feat of climbing to number one in its third weekend in release. Overall, it remained solidly in the top ten for seven weeks, including four weeks in the top three. Word of mouth has been unabated, which will carry the film through the holiday season, while the buzz surrounding “Argo” has continued to build throughout the fall, heading into awards season. In October, the cast won the Hollywood Film Award for Ensemble of the Year. “Argo” chronicles the life-or-death covert operation to rescue six Americans—spearheaded by the CIA’s heroic exfiltration specialist Tony Mendez—which unfolded behind the scenes of the Iran hostage crisis. The drama focuses on the little-known role that the CIA and Hollywood played, information that was not declassified until many years after the event. On Nov. 4, 1979, as the Iranian revolution reaches its boiling point, militants storm the U.S. Embassy in Tehran, taking 52 Americans hostage. But, in the midst of the chaos, six Americans manage to slip away and find refuge in the home of Canadian Ambassador Ken Taylor. Knowing it is only a matter of time before the six are found out and likely killed, the Canadian and American governments ask the CIA to intervene. The CIA turns to their top “exfil” guy, Tony Mendez, to come up with a plan to get the six Americans safely out of the country. A plan so incredible, it could only happen in the movies. Academy Award-winner Ben Affleck (“The Town,” “Good Will Hunting”) directed and stars in “Argo,” produced by Oscar nominee Grant Heslov (“Good Night, and Good Luck.”), Affleck, and Oscar-winner George Clooney (“Syriana”). The screenplay is by Chris Terrio, based on a selection from The Master of Disguise by Antonio J. Mendez and the Wired Magazine article “The Great Escape,” by Joshuah Bearman. David Klawans, Nina Wolarsky, Chris Brigham, Chay Carter, Graham King and Tim Headington served as executive producers, with Amy Herman co-producing. “Argo” also stars Bryan Cranston, Oscar winner Alan Arkin (“Little Miss Sunshine”), and John Goodman. The main cast also includes Victor Garber, Tate Donovan, Clea DuVall, Scoot McNairy, Rory Cochrane, Christopher Denham, Kerry Bishe, Kyle Chandler and Chris Messina. The behind-the-scenes creative team includes Oscar-nominated director of photography Rodrigo Prieto (“Brokeback Mountain”), production designer Sharon Seymour (“The Town”); Oscar-nominated editor William Goldenberg (“Seabiscuit,” “The Insider”); and Oscar-nominated costume designer Jacqueline West (“The Social Network,” “The Curious Case of Benjamin Button”). The music is composed by four-time Oscar nominee Alexandre Desplat (“The King’s Speech,” “The Queen”). Warner Bros. Pictures presents, in association with GK Films, a Smokehouse Pictures production, “Argo.” The film is being distributed worldwide by Warner Bros. Pictures, a Warner Bros. Entertainment Company. “Argo” has been rated R for language and some violent images. 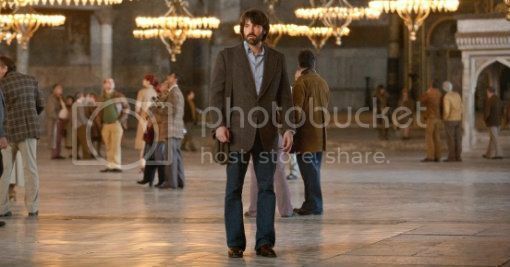 Tags: "Argo", Ben Affleck, Warner Bros. I thought the movie was great and deserves to do well. Glad to see this kind of movie getting the attention and praise it deserves.